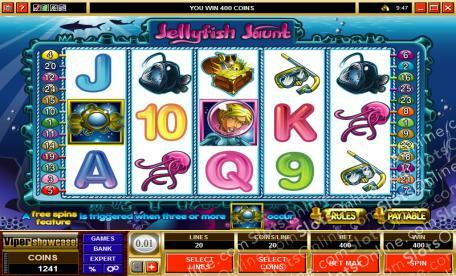 Jellyfish may be a nuisance to swimmers on the beach and an absolute tragedy when a stray tentacle latches onto a child, but they bring good fortune with them in the Jellyfish Jaunt slots. Click here to play! In it, you join Joanna the diver as she explores the world of deep sea jellyfish and you may even find some treasure along the way! Thanks to the dangers of sea travel throughout the centuries, the ocean floor is covered in chests of gold, jewels and many valuable trinkets. Joanna hopes to find bucketloads of booty in her specially designed submarine, and she has heard that clusters of jellyfish tend to mark large deposits of treasure. Apparently a certain species of jellyfish, Linuche lucre, tends to spawn near deposits of gold and valuable gems. Nearby black anglerfish point the way to the jellyfish blooms. No one knows why the jellyfish spawn near gold and valuables, and Joanna doesn't intend to find out. She just wants to find a big payday, and this whole strange jellyfish species may even go instinct if she succeeds. Join Joanna on her merciless hunt for gold, and see if you can keep her lust for gold in check, by playing the Jellyfish Jaunt slots. There's a life of riches waiting under the water, but you'll need to pry it away from Joanna's greedy little hands first! The Submarine symbol is the scatter symbol in this game, and it pays out on the total bet when 2 or more are on the reels. 2 symbols pay the same as the total bet, 3 symbols pay 5 times the total bet, 4 symbols pay 20 times the total bet, and 5 symbols pay 100 times the total bet. 15 free spins are also awarded when 3 or more land on the reels, with a 3 times prize multiplier. The Joanna the diver symbol is wild and substitutes for any symbol other than the scatter symbol.